If you want a cool sounding small amp for recording with a quality clean sound at bedroom levels, then you simply have to try a Valve Junior out. Dynamic clean and raunchy drive sounds. Superb value. Only a four-ohm speaker-out limits external cab options. 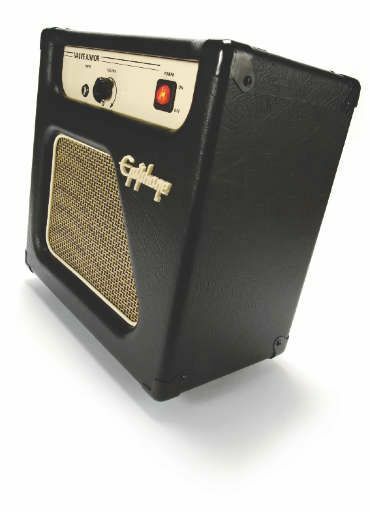 If you were an aspiring guitarist in the early fifties, pretty much all you'd get on an amp would be two valves, one volume control and an eight-inch speaker. Despite the ultra-low price, the Valve Junior's minimalism and retro stylings make for one cute little unit, with construction quality robust and confidence inspiring. Given its small physical size and eight-inch speaker, you'd be forgiven for thinking that the Valve Junior is a bedroom practice amp. However, don't expect any drive at all at neighbour-friendly volume levels without some form of attenuator. Five single-ended Class A watts ensure that the projection of the sound is impressive, assisted by the extra dispersal of the open back cabinet. The way to get the best from this amp is simply to play it wide open and control the tone with the guitar's volume knob. With a medium output humbucker you get everything from a warm, touch-sensitive clean voice to a juicy classic rock drive sound with all the inherent fireworks of a small amplifier pushed hard. A circuit this simple is also perfect for those of you who enjoy valve swapping or DIY modding.